Shortly after I left to pursue True full time, a friend of mine there took over a public outreach program: the “Solar System Ambassadors” who help educate the public about what NASA (and JPL in particular) are doing. Kay reached out to me, and I’ve been an Ambassador ever since. It doesn’t change what I share with the public — I’ve been writing about space topics on the side anyway, but this way, I get some special access to make my reports to you even better, and Kay gets “outreach credit” for the people I reach: a nice win-win. 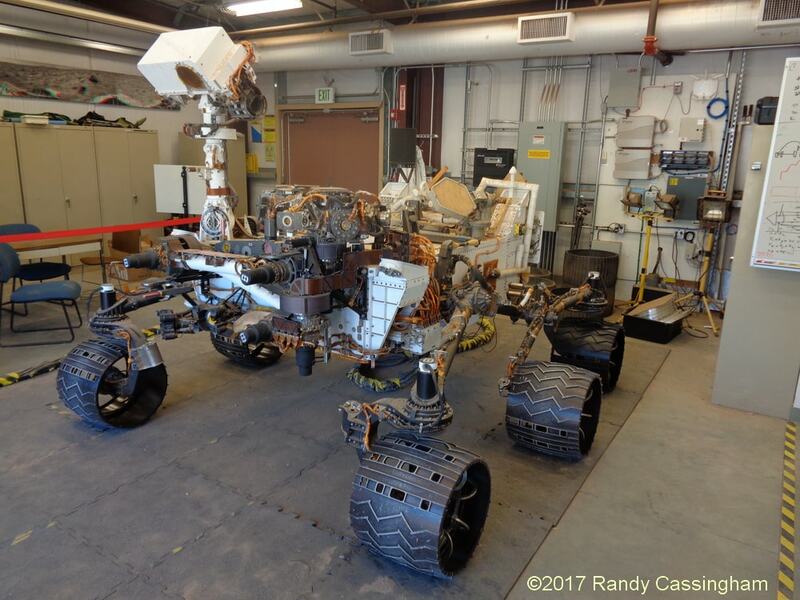 As a NASA Center, the Jet Propulsion Laboratory’s main mission is to manage the robotic (vs astronaut) exploration of the solar system, and beyond. They’re the ones that send probes out to other planets, and the rovers on Mars. And all this ties together to explain why I was in California: that “special access” I get as an Ambassador turned into a behind-the-scenes, VIP tour of the Lab and what they’ve been working on lately, being briefed by the scientists who are working on the missions. The idea: to celebrate the Ambassador program’s 25th Anniversary, and brief the Ambassadors on what’s going on so we can all explain it to the public better. I also got to bring Kit; she’s bit of a science nerd too (hey: it’s one of the reasons why we got together!) Here are just a few of the highlights. There are multiple spacecraft in the sky currently, and Mission Control is in operation 24 hours a day, every day. At JPL, it’s known as SFOF (which yes, they pronounce: “ess-foff”), for its more formal title: the Space Flight Operations Facility. It was built to support the unmanned (Ranger and Surveyor) missions to the moon in preparation for the Apollo moon landings. So it’s been running 24x7x365 since the early 1960s! In that last photo, you can see what looks like big dish antennas with radio waves. 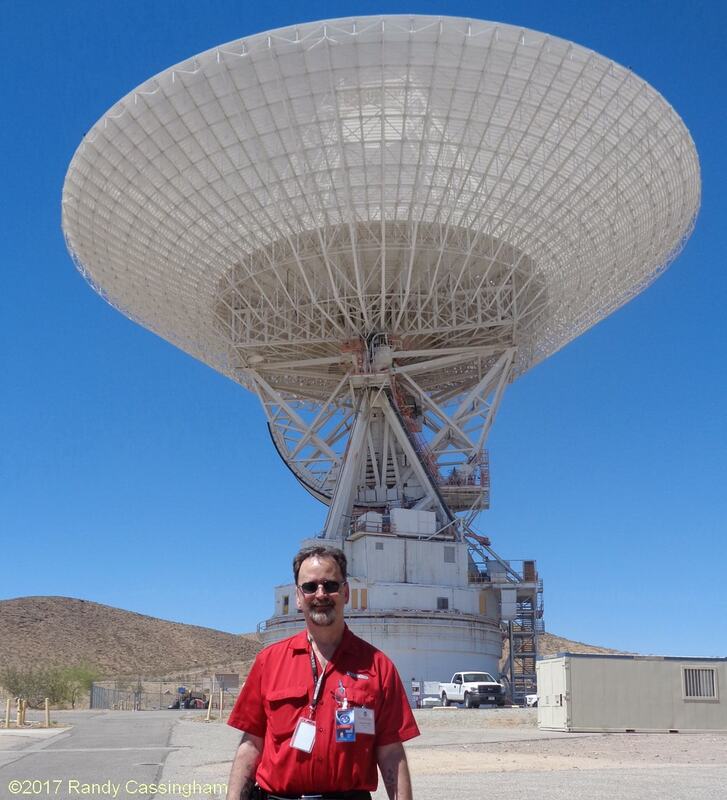 To talk to spacecraft that are sometimes billions of miles away, you need a big antenna system. More on that in a moment. Notice the holes in the wheels? That’s not just to let dust out of the wheels as they turn. It’s hard to see here, but as they roll through the Martian dust, they stamp out a pattern. That helps create milestones for the cameras to get very specific measurements. It’s also Morse Code ( · – – – · – – · · – · · ) …which just happens (cough) to spell out “JPL”. Note the holes punched into this wheel: that’s how they were able to tell they were making the wheels too thin. Six wheels support the rover’s 2,000-lb. (900kg) weight. Even though the gravity on Mars is less, and thus the weight isn’t as much there (about 750 lbs. ), Mars rocks are known to be sanded by the winds into sharp points. When they ran these wheels over simulated Mars rocks, they punched through. They fixed that well before launch. But that, as mentioned, wasn’t the only change in the wheels. When NASA headquarters saw the “JPL” on them, they said there’s no way they were going to allow JPL’s rover to stamp “JPL” all over Mars. That’s when the engineers got more creative, and came up with the Morse Code alternative. So Curiosity has been motoring around for five years now. What’s next? Mars 2020. 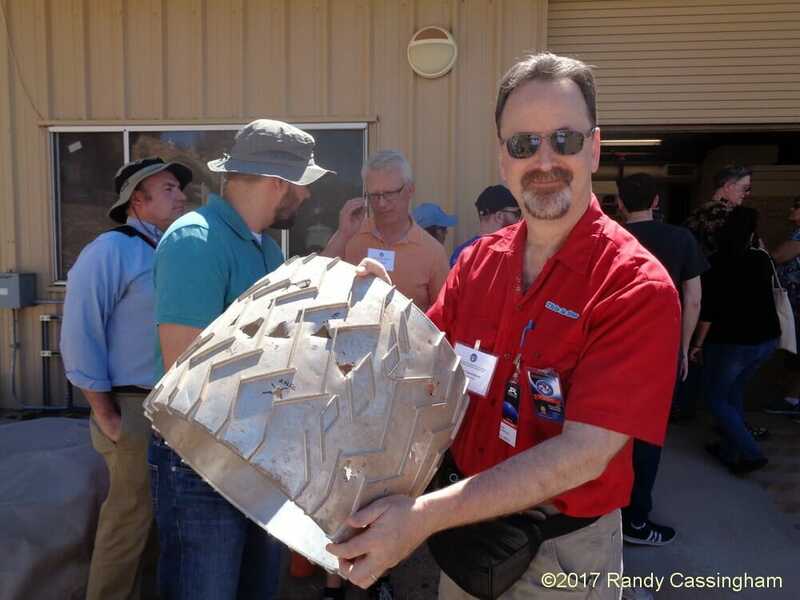 You can read about that mission at the link (Wikipedia article), but here’s what I didn’t know about this new rover mission until we got a briefing from one of the engineers: it’s going to drive around Mars to gather samples from the planet. They’ll drill into things that look interesting, and then seal the samples into tubes. The engineer who was telling us about that has the job of figuring out how the rover itself will deposit the samples into metal tubes, and then seal them so there’s no possibility of contamination between Mars and Earth. So the obvious question is, how the heck are they going to get the tubes back to Earth for analysis? Here’s the wild part: that’s beyond the scope of the Mars 2020 mission! 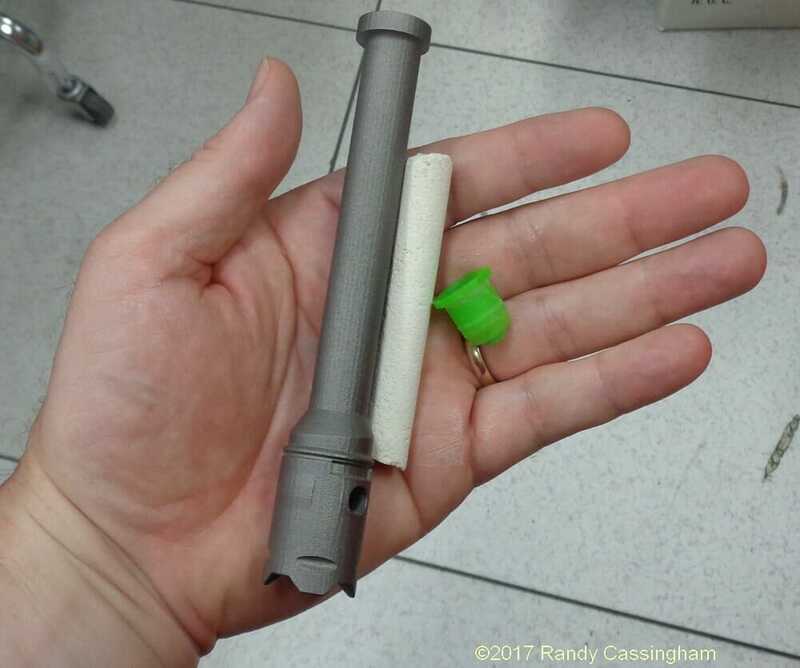 The mission after that will have the job of following in the “footsteps” of the Mars 2020 rover, pick up the tubes that it dropped, and send them back to Earth! They don’t want all their mission eggs in one basket, so they’re making that a separate mission. Wild! The building straight ahead (301) is where I started at JPL. 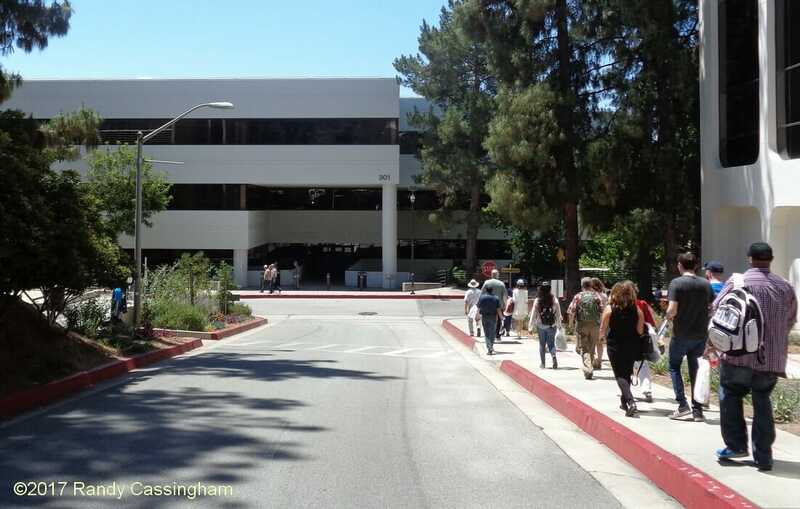 I even had a window: what looks like the ground floor from this angle is actually the second floor (JPL is built on a hill), and my office was just to the left on that level. 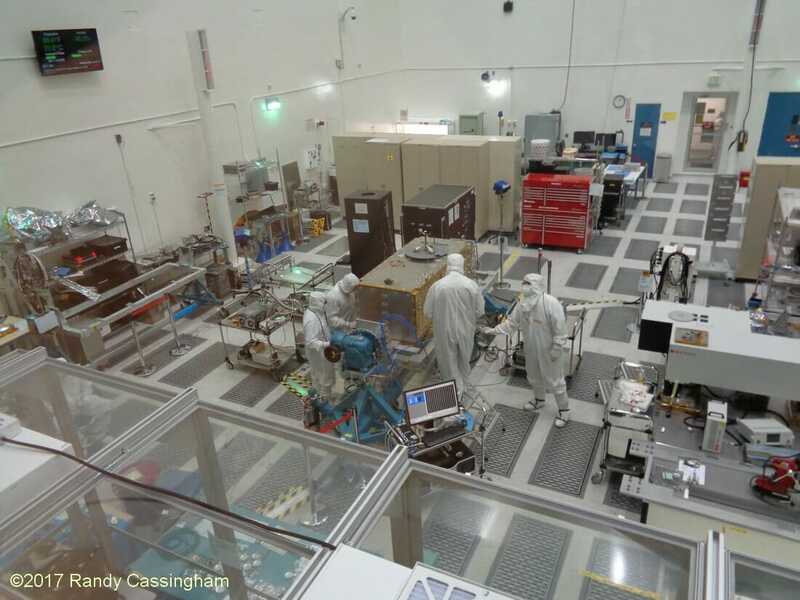 The High Bay is a giant clean room, where spacecraft are built. I used to go down there all the time during lunch to watch the Cassini spacecraft being built. It launched the year after I left (1997), and took seven years to arrive at Saturn, where it is still doing science …until September 15, 2017, when it will have a very decisive end of mission (details at the link). Engineers are working on an Earth science experiment for the space station: ECOsystem Spaceborne Thermal Radiometer Experiment on Space Station, or “ECOSTRESS”. How is the terrestrial biosphere responding to changes in water availability? How do changes in diurnal vegetation water stress impact the global carbon cycle? Can agricultural vulnerability be reduced through advanced monitoring of agricultural water consumptive use and improved drought estimation? I mentioned above that the spacecraft JPL sends out can be billions of miles away. They’re not going out there just to go, they’re out there to do science, including sending back photos. We have to get the data and photos back …somehow. The twin Voyager probes, launched in 1977, are the farthest away — specifically, Voyager 1 is the farthest. As of this writing, it’s about 12.85 billion miles (20.7 billion km) from Earth. It’s so far away that a radio signal, which travels at the speed of light, takes more than 19 hours to get there. Send a command and wait for a reply? Twice that for the round trip. Then consider the transmitter power on the spacecraft is just 25 watts. The typical radio transmitter in a police car or ambulance generally puts out 50-75 watts of signal. (Power is very scarce on a spacecraft, so they use as little as they think they can get away with.) So if the spacecraft is putting out a feeble signal from very far away, how do you receive it? With a BIG antenna. 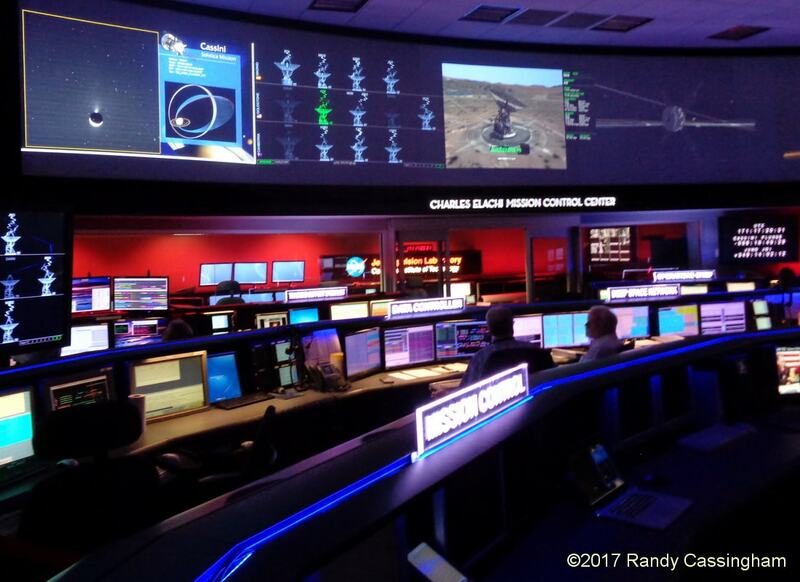 Because JPL is the lead NASA center for interplanetary spacecraft missions, it created and operates the Deep Space Network, which uses three ground stations around the world so that at any specific time, at least one of them can “see” any probe out in space. Those three ground stations are located in Madrid, Spain; Canberra, Australia; and the Mojave Desert in Southern California. 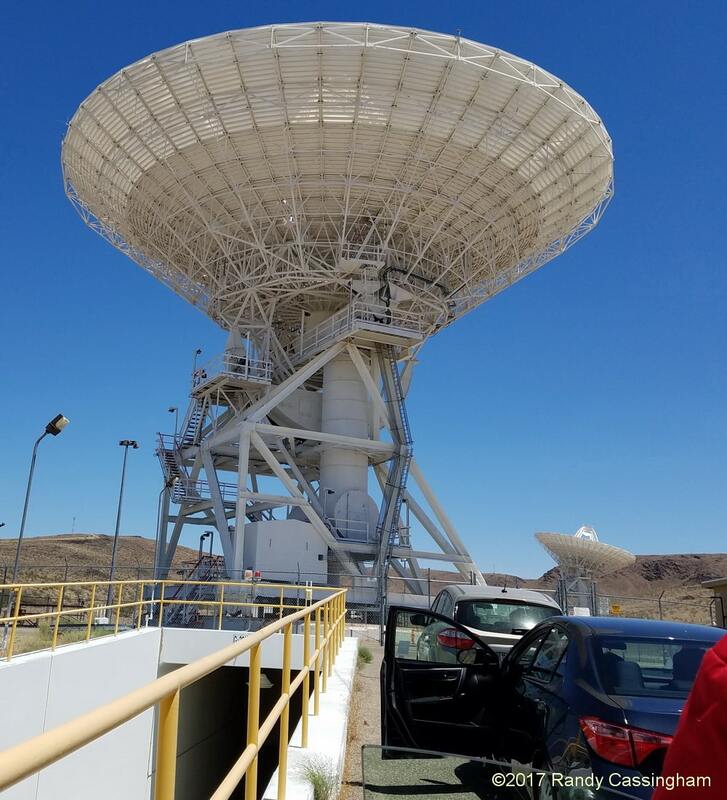 So after a day of touring JPL’s main campus, the next day we drove out to the “Goldstone” tracking stations, which are located within the confines of the U.S. Army’s Fort Irwin, a major training base. So now wrap your mind around this: the spacecraft is billions of miles away, and has a transmitter putting out less power than the light bulb in your refrigerator. So you have this huge antenna to receive that signal, but to do that it has to be really carefully pointed toward that spacecraft. So you not only have to know exactly where that spacecraft is, you have to point right at it. Which means that this antenna, which is 70m (230 feet) in diameter, not only moves, but very, very precisely! That time, we went into the control room at the bottom of the dish. We could see the platform was turning, so we just had to be careful as we transitioned onto the stairs. We climbed up to the control room, got to see everything, and came back out. When we climbed on, the antenna was pointed up, as in this photo. When we came back out, it was pointed horizontally — a 90-degree movement. And we had no idea it was doing that — it was that smooth. Astounding. Each of the three stations around the world has one of those big dishes. For less demanding communications (such as closer spacecraft), they have several smaller (34m) antennas at each station too. And consider that the Earth is spinning on its axis, so for a “long pass” (lengthy download), the antenna has to move constantly to stay directly pointed. While I left JPL to work on True full time, it’s still in my blood — officially, even, as an Ambassador (thanks, Kay!) It was an amazing place to work, and I’m glad I’m still welcome back from time to time. Incredible, Randy! And you left why??? How long do you think it will be before the mission to retrieve the soil samples from Mars? I know that all sorts tests an experiments will need to be done for this, but do you think they will be able to figure out how long ago the water evaporated? It’s actually more complicated than I mentioned — I thought the post was already getting long enough. The next mission would collect the samples and get them into Mars orbit, and a mission after that would get them from Mars orbit to Earth. Crazy! The problem is, the missions haven’t been approved yet, let alone funded. So it’s totally unclear when it might actually happen. Still, this is all about long-term planning, which is what helps lead to mission success. Wouldn’t that be billion km? Fascinating, informative, educational article. Thanks for your great work. Great article RC. I still get goosebumps watching the Curiosity landing sequence. I visited the Australian DSN dish at Tidbinbilla in Canberra as part of a school trip with my kids when they were in grade 7. The kids loved it but I was way more excited than them. Put an engineer in a place like that and you have to drag me away. 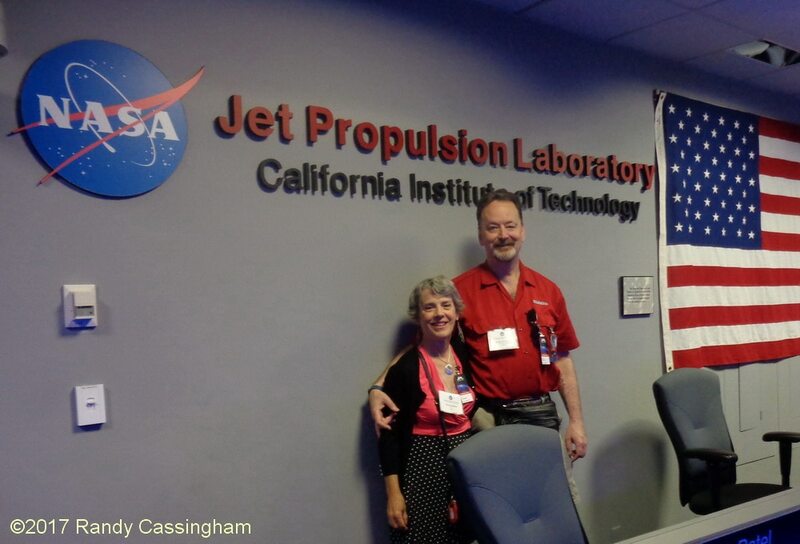 Your blog brought me back to my days at JPL. I almost laughed out load to find that your office was in the same building. My first office was behind the window in the shaded part of your Building 301 picture on the main (second level actually). I worked there between 1995 (more or less) and 2009. I agree it was the most fun of any place I’ve worked at. Sorry to be a stickler (Yes, I’m an engineer!-) but wouldn’t the “JPL” on the tires in your photo have left tracks that were a mirror image? I’m pretty sure that Tony was asking about the original wheels with the letters JPL printed on the wheels. They would indeed have left mirror images in the dirt. That always bugged me too. I figured that the actual flight wheels would have the JPL mirrored, but then along came the Morse code idea. That was so much cooler because the dots and dashes don’t care about the mirroring. And they are more subtle. I also had the opportunity to work there for a couple of years in the late 80s – Building 26. Got to experience the Whittier Narrows quake there one morning. Watching the glass tower was interesting. Wonderful bunch of folks to be around and work with. Richard Morris was my technical boss. I believe he was associated with Voyager as well. I’m curious about your opinion of manned space travel (and Mars in particular). I love all these robots in space; they are doing really great science. But people in space (or on Mars) doesn’t make sense. Our vision is the only sense we could employ, and human eyes are inferior to HD cameras (especially when those eyes are behind a heavily shielded visor). Robots “see” in HD, 360-degrees, and they can (and do) stay on-station for YEARS. We could carpet Mars in rovers for the cost of a manned mission, and a robot mission poses no risk to human life. Robots can (and should) pave the way, but the real goal, as Randy suggests, is to get humans to the level of living beyond our home planet. That whole page is required reading for anyone interested in space! Changes in our atmosphere will not drive us to space (where there is no atmosphere) or Mars (poisonous thin atmosphere). Overpopulation isn’t actually a global problem; we have millions of sq.km. of land we’re not using (deserts, the Antarctic (which is, on average, warmer than Mars and easier to get to), we could dig giant caverns, etc), all of which are FAR more habitable than space or Mars (they all come with air, a magnetosphere, and an ionosphere, which Mars doesn’t offer). Radiation won’t drive us to space; I doubt there’s even enough radioactive material in the earth to render the entire earth uninhabitable, and even so, we could dig caverns or live on the sea floor (both cheaper, easier, and more feasible than evacuating to Mars). Besides, deadly radiation is already the single biggest problem with living on Mars (or getting there). And forget big space rocks; we’ve catalogued everything that crosses our orbit that is larger than a breadbox. There are simply no extinction-sized rocks out there anymore (and it’s not like they can hide). We can screw up our planet pretty bad, but I doubt we could make the entire planet any worse than Mars already is.